These English scones with light and tender, cake-like crumbs are incredibly quick and easy to make. It’s practically impossible to mess up. You only need 30 minutes! I’ve never liked scones. American scones, that is. They look fantastic, loaded with nuts, fruits and glazed, but they definitely don’t deliver the moist, flaky promises they make. At least, the ones I’ve tried. Granted, I’ve never tried making them myself. Afraid of disappointment, I guess. Anyway, when we had an Afternoon tea at Savoy in London, we enjoyed the most deliciously moist and tender English scones for our first course. Oh my goodness, I was in love! They were super tender, cake-like and light! We actually had to ask for more scones! Since then, scones shot right up to the top of my to-bake list. After a few batches of trial and error, I’m finally ready to share with you my findings! But before we dive into the recipe, let’s rule out a few things. Well, first, the amount of butter. 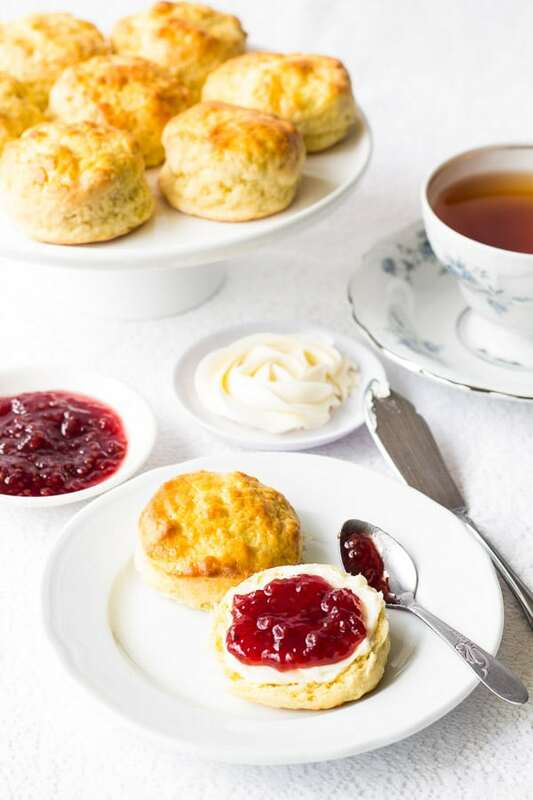 English scones use way less butter than american version, but they are meant to be served with whipped butter, or clotted cream and sweet jam/jelly. And unlike american scones, British scones are smaller in size and doesn’t have hundreds of varieties. You’ll only see plain scones, or with raisins/currants. Sounds a lot like biscuits, doesn’t it? But there are some differences too. 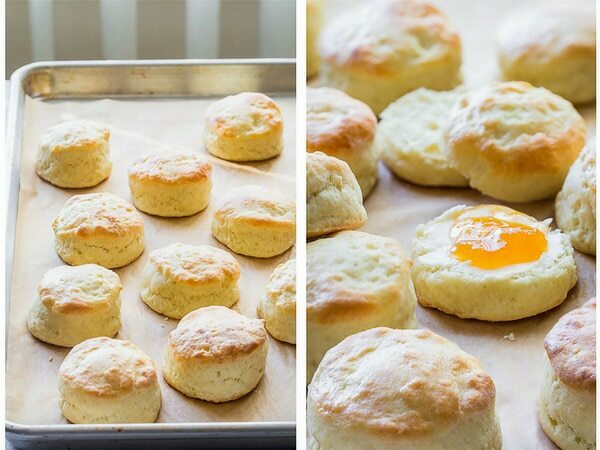 Biscuits are flakier and crumblier than scones. English scones, on other hand, are quite light, but most importantly, they have delicate cake-like crumbs, that sets them apart from American scones and biscuits. Now that we have a full understanding of what we’re getting, let’s talk about how to make english scones. I learned the technique for these scones on Cook’s Illustrated and slightly adapted their recipe. 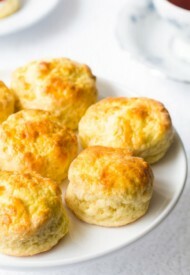 I’m using buttermilk/milk mixture in my batter for the lightest and moistest scones. In a pinch, you could use all milk, but use whole milk for the best flavor and richness, as there is not much fat going on in the batter. 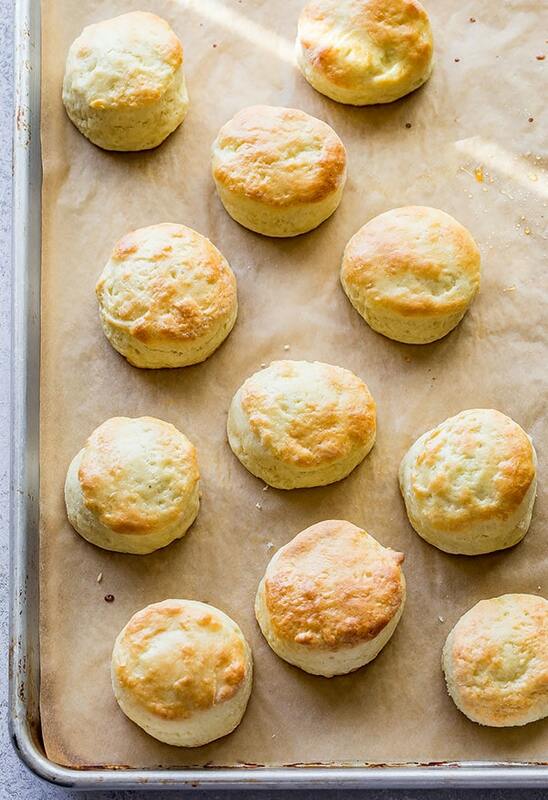 Unlike biscuits, or American scones, we don’t need to use cold butter to create flaky scones. Instead, we will thoroughly incorporate softened butter into the dry flour mixture. This method minimizes the formation of gluten, as fat in the butter coats the flour proteins. Hence, tender, crumbly and light scones are born! The batter will be a bit sticky, but don’t fret. It’ll be work out beautifully! I loved serving my scones with sweet whipped butter and jam. My favorites are raspberry jam and apricot jam. My husband prefers strawberry jam though. Either way, they are great! So have you tried English scones? 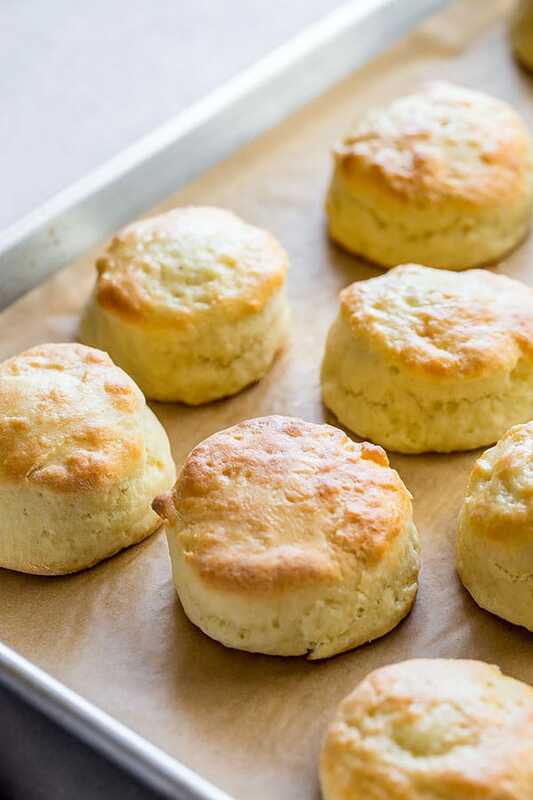 Which one do you prefer, American scones, British scones, or biscuits? 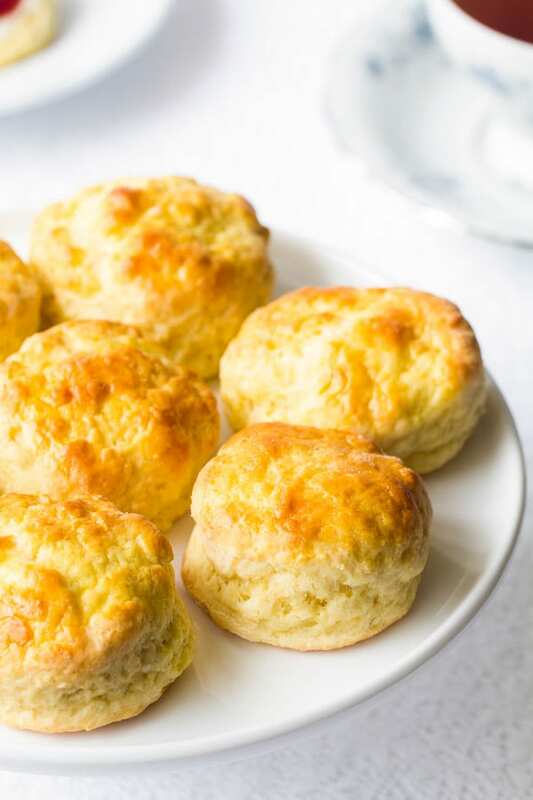 If you have a trusted recipe for tender (not dry) american scones, please share it with me in the comments. Thanks for stopping by! English scones with light and tender, cake-like crumbs are incredibly quick and easy to make. You only need 30 minutes! It’s our family’s favorite! To make the scones, preheat the oven to 450°F (230°C). 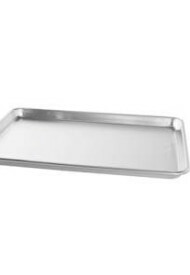 Line the baking sheet with parchment paper, or silicone mat. 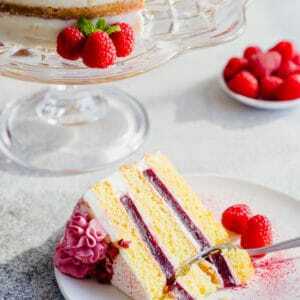 In a medium jug, beat the eggs, buttercream and milk. Reserve about 2 tablespoons of mixture. 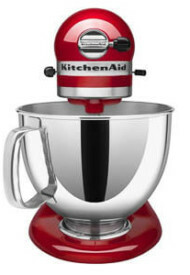 In a mixing bowl with paddle attachment, mix together flour, sugar, baking powder and salt. Add egg mixture and mix until just combined. The dough will be quite sticky, but don’t worry. Transfer the dough onto well-floured surface. With floured hands, knead the dough to smooth out the surface and flatten it into 1-inch thick disk. Using 2-inch round cookie cutter, cut out as many scones as you can. Gather the remaining dough and repeat the step #5, until all the dough is used. Arrange the scones on the prepared baking sheet, brush on the reserved egg mixture on each scone and bake for 10-12 minutes, or until golden brown. Cool the scones on wire rack for 10 minutes. Serve warm or at room temperature with sweet whipped butter. To make the sweet whipped butter, beat the butter, heavy cream and honey in a mixing bowl with whisk attachment until nice and fluffy. Freezing Instructions: These scones freeze beautifully. Simply place the baked scones in a ziplock bag and freeze for up to 3 months. 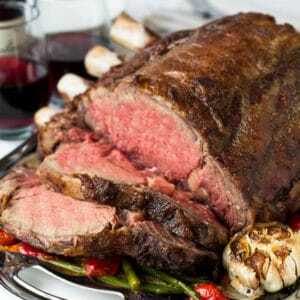 When ready to serve, microwave on high for 30-45 seconds, or bring it to room temperature on counter. Video: I’ve made this recipe on my Instagram stories. If you’d like to see the recipe in action, check out my Instagram and find the featured story for English Scones. Slightly adapted from Cook’s Illustrated. This recipe was originally published on April 22, 2015. Updated with new photos in May, 2018. Yay, so glad you enjoyed the scones. Thank you for your feedback, Moni! Hi, Shinee! I’ve never tried making scones before, so I’m very excited about your recipe. Especially because the scones in your photos look scrumptious! However, I’m absolutely terrified at the amount of baking powder this recipe calls for. 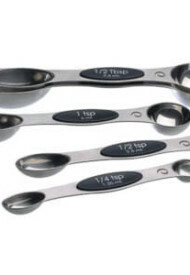 Are you sure it’s tablespoons and not teaspoons? I think that may have been the reason behind Holly’s [above comment] absolute gloopy gluey mess. Are you sure your gram conversions are accurate? I really don’t know what went wrong here, I have been making English scones for a long time (being English!) and tried your recipe, followed the instructions to the letter (weighing out number of grams rather than cups) and my ‘dough’ was an absolute gloopy gluey mess that certainly couldn’t be kneaded! I ended up having to get someone to scrape it off my hands and chuck a load of self raising flour in there until the dough reached the right texture. I think this is the first time in my life I’ve managed to mess up scones – I didn’t think that was possible! Hi, Holly! I’m so sorry to hear your dough didn’t turn out. I just double checked the measurements and everything looks right. I even checked it against the original recipe on Cook’s Illustrated. I’m puzzled as what went wrong. Since you’ve weighed the flour and everything, it should have been accurate. I’m clueless. Yes thoroughly mixed the ingredients. 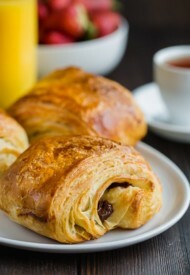 The scones looked exactly like the ones in the picture! My only other guess would be the flour amount. If you didn’t weigh the flour when measuring it, it’s very possible you’ve added a bit too much. Excess flour will definitely cause denser scones. I tried these scones and they did not turn out good. I did exactly what the recipe told me, and my scones looked like the ones in the picture, but they did not taste good at all! They were really dense! So disappointing! Save yourself all the work and money, because these scones are…….. Don’t try them!!!!!! Hi, there! I’m sorry for your experience. I’m surprised your scones turned out dense. 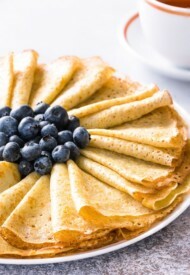 Did you thoroughly mix the dry ingredients with softened butter? This step is crucial for light and cake-like texture of these scones. I’ve made this recipe many times, and always get light scones. Yay! Thank you so much, Cindy! Thanks for the clarification between American scones, English scones and biscuits. 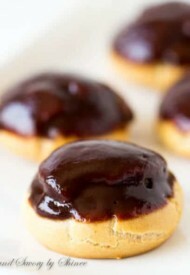 I might make some this weekend. Sounds great. If you do make it, let me know how they turn out, Quinn. Thanks! These look wonderful. I’ve mastered white bread and wheat bread. I have a French bread recipe I like…but am looking for one I like better. But I have had horrible luck with biscuits. Maybe I’ll give scones a chance. (Yes, I read they’re different than biscuits!) Figured maybe a different “format” of bread might work better. Thanks for the step-by-step pics. I find those so useful, especially with bread products. I’m glad my step by step photos are helpful! Definitely give these scones a try. They are now our family’s favorite. Hope you will love it too. Thanks for visiting! These look great! Thanks for the tutorial and info. My pleasure, Samantha! I’m glad you find it useful. Thanks for stopping by! Stopping by from Lou Lou Girls. 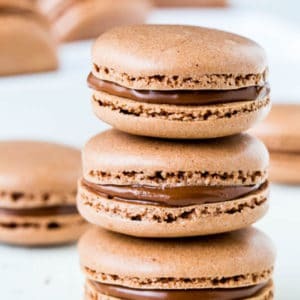 These would make a wonderful after Church snack. Pinned! They make a great snack. Thanks, Heaven! Yum! I love scones. I’ve tried one recipe once, but the scones were so dense! I’m going to give your recipe a try! Thanks so much! Sounds great. Let me know how you like these, Ashley. Oh my! Your description of these is amazing. I can almost taste them! I’ve always thought scones were awful but I think you’ve convinced me to give yours a try for sure!! Yum! Do try! 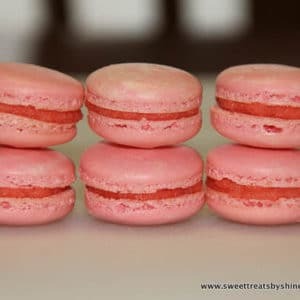 These are so soft and delicious! Thank you, Jennifer! Meant to add the Clotted cream is from Devon or Cornwall, most often. Just to let you know of a slight error in your post. It’s clotted cream (usually from Devon) not clotted cheese. Whoops, thanks so much for pointing it out, Amanda! As you can see, we don’t really use clotted cream too often around here. 🙂 Just fixed it. I am an excellent baker but my biscuits always seem to come out like a hockey puck! But because these scones are put together so differently I think I might have more luck. I’ll let you know how it goes! I just looked at the last of your vacation pictures and they were lovely! or should I say yummy? Looks like you had a fantastic time. 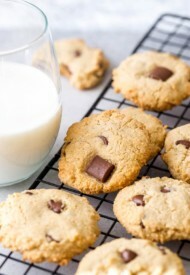 The trick is in incorporating butter into flour mixture to prevent too much gluten development. It worked perfectly every time. I hope you will have the same success. Please do let me know how you like them. Thank you, Cynthia! These look sooooo good!! Yummmm! Anyhoo, I found your blog through a fellow blogger, and just thought I would stop by and say hi! It would totally make my day if you did the same.. or better yet, keep in touch! English scones, British scones, or biscuits. . I’ll take them all!!! 😛 Will definitely try these!! Love these, Shinee!! Shinee, these look amazing! 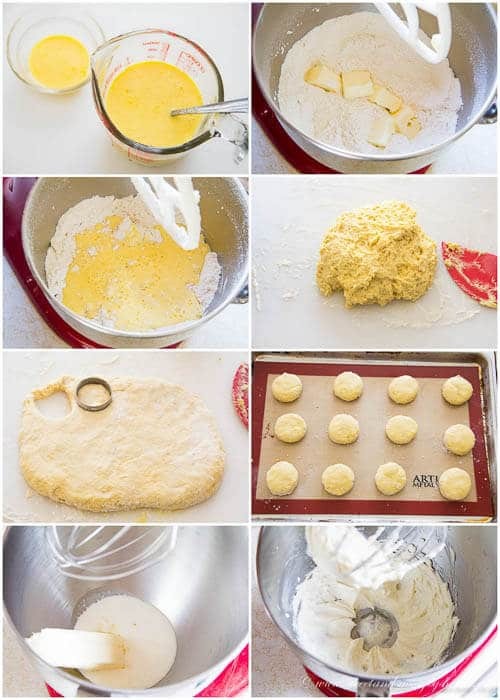 And this is so eye-opening for me to see how easy scones are to actually make! Thank you! Yes, super easy and quick. Thanks, Cyrus! Shinee, these look SO good- It’s so hard for scones to come out so pretty! HOLY COW THESE ARE GORGEOUS! I’m drooling! Hi, Beeta! Yes, these were absolutely delicious. Thanks for stopping by! 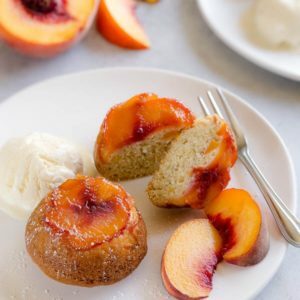 I like the idea of these way more than other scones! I tried making scones once and failed — these look way better!